August Smart Lock Review: Is It Reliable Enough To Ditch Your Keys? / August Smart Lock Review: Is It Reliable Enough To Ditch Your Keys? The Homekit enabled August smart lock allows you to use an app to lock and unlock your door. You can even setup options that will automatically lock and unlock your door as you come and go. If you go for full smart home integration, you will also be able to coordinate other smart home actions with the locking and unlocking of your August smart lock. Imagine the following scenario: It’s dark and you just got home. You’re carrying a full load of groceries (or kids or beer or whatever you tend to carry around at night). As you approach your door, instead of fumbling for your keys, you hear your deadbolt automatically sliding open. Then, you hear the reassuring chime of the August smart lock from the other side of the door confirming the door has been unlocked. Simultaneously, the lights in the house come on. Now, instead of blindly reaching for the light switch, you walk right in. You don’t trip over some misplaced shoes and you don’t drop the milk or break the eggs. The groceries (or kids or beer) get safely delivered. After a moment, you start to make yourself comfortable and you hear the deadbolt automatically lock behind you. The August sounds off another chime which signals the door has been secured. Mission complete. Alright! I hope that wasn’t too melodramatic. The imagined scene above has actually been my recent reality. I spent the last two weeks with the August smart lock installed on my door. I locked and unlocked my door wirelessly over a hundred times with it. I left the house and returned over 30 times to test its automatic locking and unlocking features. I installed it, uninstalled it, then installed it again. I put it through the wringer so I could write this review for you. 1 What Is The August Smart Lock? 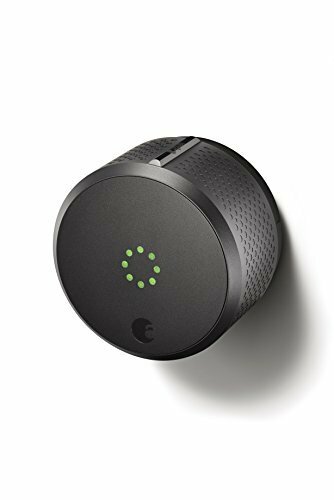 6 How Do I Connect My August Smart Lock To Other Smart Home Devices? 7 How Do I Install The August Smart Lock? What Is The August Smart Lock? The August smart lock isn’t actually a lock by itself. It would be more accurate to call it the August smart latch turner. Instead of completely replacing your deadbolt, it only replaces the inside half of your existing deadbolt. You install the August app on your smartphone and you can lock and unlock your door with the tap of your finger on your smartphone. Or, you can turn on the auto-lock and auto-unlock features so that the lock automatically locks and unlocks as you come and go. If for some reason the app doesn’t work or the batteries die, you can still turn the lock by hand from the inside or using your physical key from the outside. My initial reaction to the August lock was that it’s big. It looks kind of awkward and out of place hanging on the door. Despite its awkwardly large size, it’s still an attractive piece of equipment up close. It’s available in silver or dark gray. I got the dark gray version which basically looks black. The matte finish and the knurled grip give it a unique but polished look. A circular dot pattern of LEDs lights up when it locks or unlocks: red for locked and green for unlocked. The August lock lights up green while unlocking and red while locking. For as big as it looks, I would expect it to be a little heavier. Apparently, there’s a lot of plastic and empty space inside. If you’re expecting some over-engineered, precisely machined metal parts, you will be disappointed. That’s not too big of a deal, though. It’s only replacing the inside thumb latch which has no effect on the integrity of your lock. So, it doesn’t really matter that parts would start flying if you smacked it with a hammer a few times. The auto-unlock feature is designed to unlock your door automatically when you arrive home. It does this by using a combination of your smartphone’s GPS, WiFi, and Bluetooth. 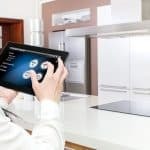 You may be thinking, “Why in the world does it need GPS, WiFi, and Bluetooth to do what seems like one simple task?” The answer is because unlocking your home’s door is a serious security issue. August cross-checks data from each to make sure your lock only unlocks when it’s supposed to. From what I can tell, August has been working hard to resolve past issues with the auto-unlock feature and these cross-checks are part of that work. Lots of people have had problems getting this feature to work well. I read a lot of scathing reviews before I bought my lock and because of that, my expectations weren’t too high. However, I have been pleasantly surprised with how well it works. In fact, as long as I have the August app open, it has always unlocked successfully. I have had a few times where I walk up to the door and I have to wait a second or two before it unlocks. But in those instances, I suspect that I snuck up on it too quickly. The time between me first getting into Bluetooth range and me getting to the door is only a couple seconds (I’m a fast walker). You can toggle auto-unlock reports on or off in case the feature isn’t working like it should. This feature will let you shut your door behind you and walk away. You can be confident the August smart lock will lock up for you. 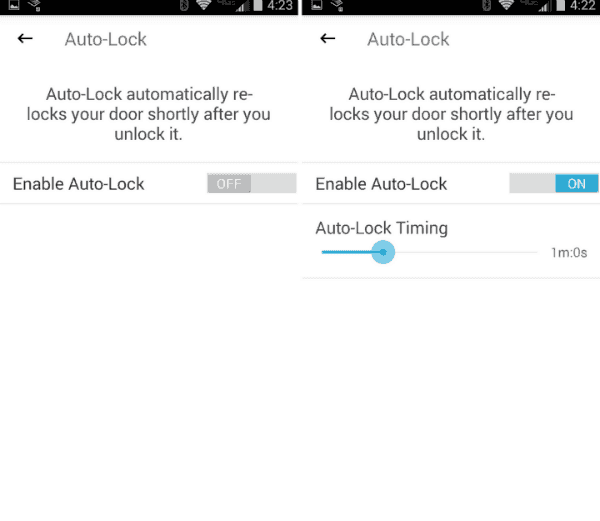 Enable the auto lock feature of the August smart lock and it will simply re-lock itself every time you unlock it. It doesn’t matter if you used the app to unlock it or manually unlocked the lock. If the auto-lock feature is on, the countdown timer will start and when the time is up, it will lock. You can adjust a slider in the settings to tell August to lock anywhere from 30 seconds to 5 minutes after you have unlocked it. You also have the option to turn the auto-lock feature on or off in the settings. The auto-lock feature of the August smart lock is very reliable. Unfortunately, it’s so simple that anything less than 99.9% reliability would be embarrassing. Be careful though, because it’s not a very smart feature. It doesn’t matter if the door is still open or if the door happens to be swinging shut or if you are taking the garbage out and didn’t bring your keys or phone. When the time is up, the door will lock! Once you set up your initial account, you have the ability to invite others to use your lock as well. You can invite owners or guests. Owners have access to all features all the time. Guests only have access to some features some of the time. 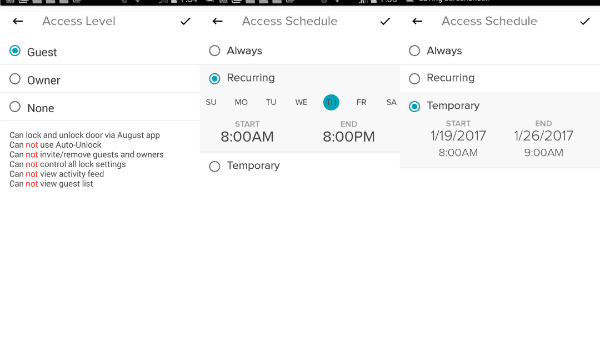 For guests, you also have the option to choose a one-time access or a recurring access schedule. Setting up one-time or recurring access for guests is easy. How Do I Connect My August Smart Lock To Other Smart Home Devices? The August needs to run on batteries (I don’t think many people have power outlets in their doors) so power-sucking WiFi is not a viable option. Instead, it uses Bluetooth LE technology to communicate. Therefore, since it can’t connect directly to your home WiFi, you need a device that can connect to the lock via Bluetooth and then relay the message via WiFi. In order to enable some cool features that will truly integrate your lock with your smart home, you will have to use one of the following methods. The August lock is HomeKit enabled, so if you have an iPhone, you can use Siri to control your lock. If you have a 4th generation Apple TV that is within Bluetooth range of your lock, you can also connect your lock to other smart home devices and use Siri to operate your lock remotely. The August Connect (see on Amazon) is a hub that will allow you to connect your Bluetooth August smart lock with your home WiFi router. Once you get your lock tapped into the WiFi network, it opens up the ability to interact with other smart home devices. If you have the August Doorbell (also available on Amazon), you probably won’t need the August Connect. The doorbell has both WiFi and Bluetooth so it can be used as a hub for the lock. 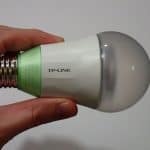 With Which Smart Home Devices Is August Compatible? 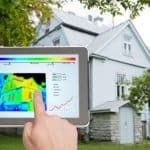 Once you connect your August lock to WiFi, it opens up the possibility to integrate with several other popular smart home platforms. August also has an IFTTT channel. The August IFTTT service can only be used as a trigger for any action. That means if someone locks or unlocks the August, you can have it perform some action (for example, turn on some lights). But, you can’t use IFTTT to lock or unlock the August. August “Works With Nest”. You can use your August app to view Nest Cam video or use your lock’s status to set Nest thermostat (see my Nest Learning Thermostat review) to home or away. How Do I Install The August Smart Lock? The first time I installed the lock, it took me about 15 minutes. The second time I did it, it only took 5 minutes. I think it’s safe to say that as long as your lock is compatible and your door deadbolt works well, installation is easy. The August lock is not compatible with every type of deadbolt. August keeps a list of all the officially supported locks here. 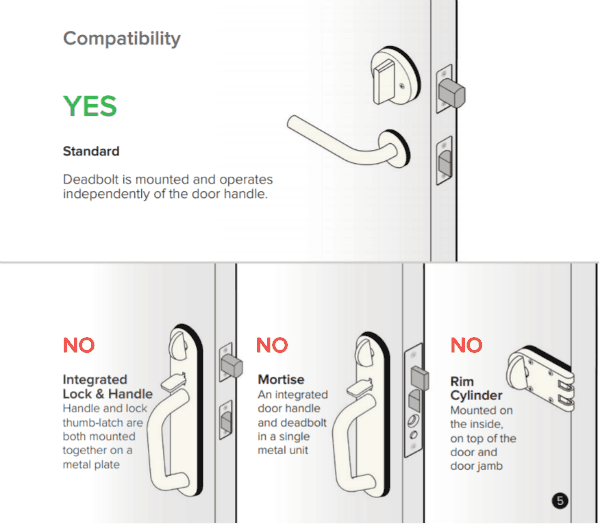 The following photo from the August website shows which locks are generally compatible. 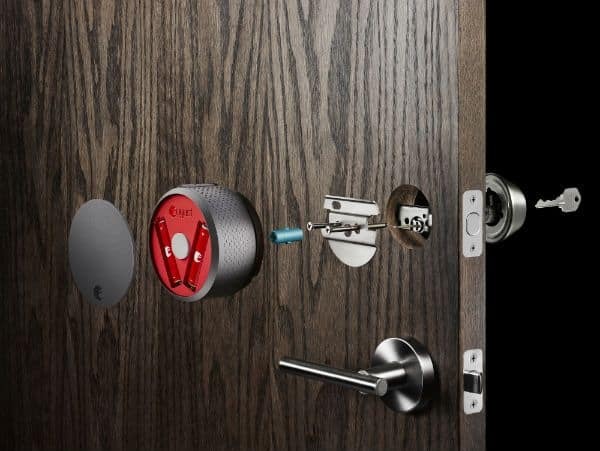 Before you even think about buying the August smart lock (or any smart lock for that matter), you need to make sure your existing deadbolt works well. What I mean is that the deadbolt needs to slide easily into and out of the locked position. You’ve probably used a door where you had to push hard on the already closed door in order to get the deadbolt slot to line up so you can lock it. The August lock will give you problems if that’s how your door operates. It may fail to lock or unlock completely. Even if it does work, batteries won’t last as long because as they lose their voltage, it won’t be enough power to overcome the friction. The lock is only powered by 4 AA batteries. It isn’t designed to have the strength of a hydraulic press. It just needs to be strong enough to slide the bolt in and out of its slot reliably. Some people have purchased a tapered replacement deadbolt to solve this problem. However, I think that’s kind of treating the symptom instead of the disease. I prefer to solve the problem at its source by fixing the door instead of spending more money on a completely different deadbolt. Remove the decorative cover plate on the inside of your deadbolt. For most locks, this will involve removing two screws. Now the inside of the lock should be exposed. You should see two more screws that will need to come out. These two screws are what’s holding your lock together. So, before you take them out, use the included blue tape on the outside of the lock. The tape will stop the lock from falling out when you remove the two screws. Remove the two screws and the inside mounting plate should come off. Next, find the replacement mounting plate included with August lock. Line up the holes and use the two screws you just removed to fasten the plate to the door. Believe it or not, you’re almost done! There should be a metal shaft in the center of your existing lock. This is the shaft that operates the bolt. Your August lock comes with 3 little circular plastic inserts. Take a look at the shape of that shaft and find the plastic insert that best matches the shape. Slide the plastic insert onto the shaft. Now, take a look at the back side of the August lock and you will see two little plastic “wings”. Extend the wings as far as they go. Visually line up the grooves on the plastic insert with the grooves on the back side of the August lock. As you push it into place, make sure that the plastic insert gets fully seated into the August lock. Once the lock is fully seated, line up the wings with recessed area on the mounting plate and push the August lock into place. Push the wings in to secure the lock and you’re done! Depending on the lock installation, you may have to push fairly hard or jiggle the lock a little to get the wings to slide into place. 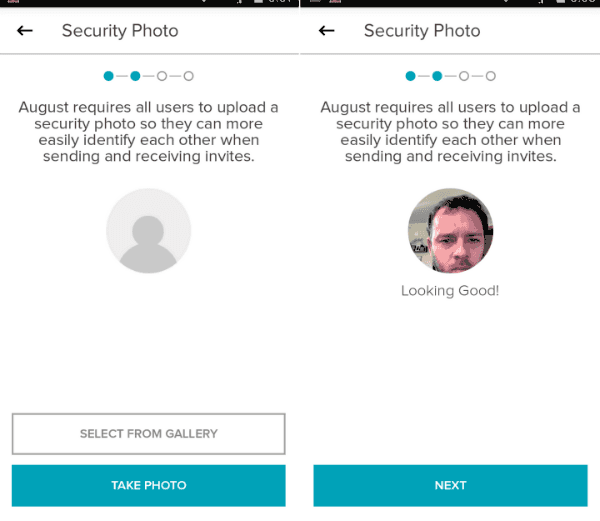 Once the lock is installed, you can download the app and create an account with August. 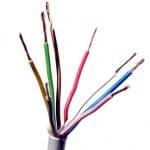 Enter a few details and add a security photo then you’re ready to start the setup process. No matter how angry you look, you’ll get the obligatory “Looking Good!” after adding your security photo to your account. You’ll want to be close to the lock and make sure you have Bluetooth enabled on your phone. You will probably have to do a firmware update which will take anywhere from 5-10 minutes. It may ask you to reboot the lock a couple times by removing and replacing a couple batteries. Just follow the on-screen prompts and everything should be fine. I saw reports of the lock failing to lock due to a jam or sticky deadbolt, but the user would still get a successful lock notification. So, the person went about their day thinking their house was all locked up, but it wasn’t. Obviously, that’s quite a security risk and a major problem. I tested this problem by intentionally lining up the door so the lock tried to open into the jamb. The August made some grinding noises and failed to lock (as planned). Then, it sent me a notification that the attempt to lock failed and it that it may need calibration. I tested it multiple times and not once did I get a notification that it was locked when it actually wasn’t. Great! It appears August has taken care of that problem. My overall experience with their customer service was okay. Everyone I dealt with was friendly and helpful. However, I first contacted them on a Friday afternoon and didn’t get my problem resolved until the following Wednesday morning. I wish they would have been a little more timely with their replies, but the problem was eventually resolved. I definitely recommend phone support if you want an answer quickly. The August lock I purchased was an open box return. It was basically brand new (still had the protective plastic on it) but no matter what I did I could not get my August app to recognize the lock. I couldn’t access my lock because it was still paired to the previous owner. First, I called. After being on hold for about five minutes, I described my problem to the operator and he informed me that I was correct with my diagnosis. He told me they would have to try to contact the previous owner and ask them to give permission for me to take over the lock and that he didn’t know how long it would take. I waited a couple hours and didn’t receive any news. So, I decided to try email support. Their auto-mailer replied instantly assuring me I would get a response within 24 hours. Thirty hours later, I got a response. Again the representative confirmed my diagnosis of the problem and this time requested I send him the serial number of my lock. I sent him the serial number and waited another day and a half. Then, they asked me to send my proof of purchase so they could reset the lock. I sent it and waited. After almost two days, I got a reply that they had reset my lock and it was ready to use. Hooray! In my opinion, the ultimate goal of a smart lock should be to automatically unlock and lock when I come and go. Therefore, to me, the auto-unlock and auto-lock features of the August lock are its most important features. The automatic unlock feature performed consistently well for me. I don’t think I trust it quite enough to leave my physical house key at home, but part of that is I don’t trust myself enough to make sure my phone battery doesn’t die. My main gripe is the lack of smarts behind the auto-lock feature. It’s just a simple timer that starts counting down after I unlock the lock. I can think of several scenarios where I might manage to lock myself out of my house with this feature enabled. I must admit before I bought my lock, I read a lot of angry Amazon reviews that had me ready to be disappointed. However, after installing the August Smart Lock and using it for myself, I was pleasantly surprised. 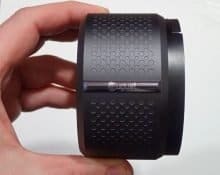 There are still a few nagging issues that keep this lock from giving me the perfect seamless user experience I’m looking for when I buy a smart product, but my overall experience with the August smart lock has been a positive one. I think as long as you are aware of its limitations from the beginning, you should be able to buy with confidence. Thank you for this review, it was very informative. I had an old electronic lock and recently switched to a newer smart lock and I’m glad I bought a new one. I actually recently replaced it with the upgraded lock, because the battery kept dying in my old electronic lock, which forced me to go get my emergency spare key (buried in the backyard and not easy to get to). My new lock has been going strong with only one set of batteries. The August smart lock will alert you if your lock’s batteries are getting low. That way you can replace the batteries before get locked out when they die.